Ever-increasing storage demands have a negative effect on an organization's IT budget and complicate the overall storage infrastructure and management. Companies are looking at ways to use their storage resources more efficiently. Thin provisioning can help by reducing the amount of unused storage that is typically allocated to applications or users. Now available for the IBM® DS8880 for Fixed Block (FB) and Count Key Data (CKD) volumes, thin provisioning defers the allocation of actual space on the storage system until the time that the data must effectively be written to disk. 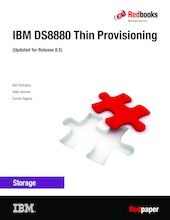 This IBM Redpaper™ publication provides an overall understanding of how thin provisioning works on the IBM DS8880. It also provides insights into the functional design and its implementation on the DS8880 and includes illustrations for the configuration of thin-provisioned volumes from the DS GUI or the DS CLI. This edition applies to DS8880 Release 8.5 or later.